Europe’s Ariane 5 workhorse conducted a rare single-payload launch on Wednesday, lifting the Intelsat 29e satellite into an optimized Geostationary Transfer Orbit. The 55-meter tall rocket lifted off from the Guiana Space Center at 23:20 UTC and needed less than 30 minutes to reach the planned elliptical orbit from where the satellite will boost itself into Geostationary Orbit to start delivering communications services. The launch marked Ariane 5’s 70th consecutive success, opening another busy year of launches for Arianespace with its trio of launch vehicles, the small Vega rocket, the Russian-built Soyuz and the heavy-lift Ariane 5. Wednesday’s launch only saw a single payload riding into orbit atop the Ariane 5 rocket which normally offers sufficient performance to lift a pair of satellites – one larger passenger in the six-metric-ton class and one lighter spacecraft weighing in at around three metric tons. However, in recent times, there had been a shortfall in smaller satellites meaning that heavier craft that had been ready for launch needed to wait for a co-passenger to be ready. To avoid a lengthy wait for a launch around mid-year, Intelsat – one of the world’s leading satellite communications providers – made the decision to foot the bill for an entire Ariane 5 and launch the satellite on a dedicated launcher. Eutelsat made a similar decision, opting for a single-payload mission atop Ariane 5 later in the year. 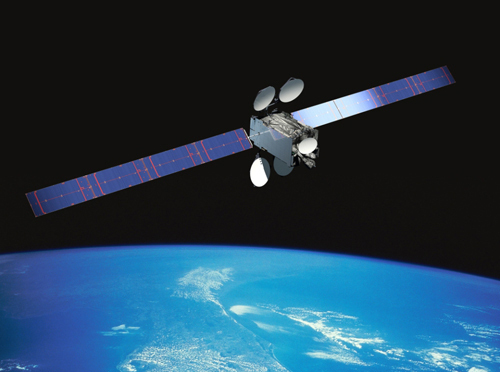 The 6,552-Kilogram Intelsat 29e spacecraft is a high-throughput communications satellite based on Boeing’s BSS-702MP platform. It hosts a multi-band payload of 12 high-power C-Band and 46 Ku-Band transponders plus a Ka-Band payload for global coverage, reaching a total satellite throughput of 25 to 30 Gigabits per second. The satellite will deliver full coverage of South America in C-Band for media distribution, spotbeam coverage of the Americas using Ku-Band, wide-beam coverage of the Atlantic for airborne and maritime communications services, and a high-powered global Ka-Band coverage zone centered on Brazil, but stretching from the Americas to Europe. Wednesday’s flight of the Ariane 5 rocket with a light load leveraged excess performance to optimize the inclination of the insertion orbit for Intelsat 29e. 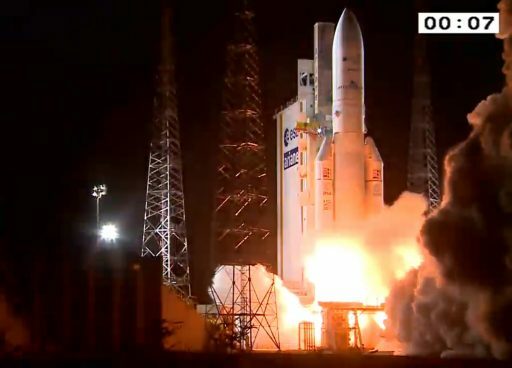 Instead of the standard 250 by 35,786 km, 6.0° orbit to which Ariane 5 can deliver ten metric tons, Intelsat 29e was aiming for an insertion orbit of 249 by 35,546-Kilometer orbit at a reduced inclination of 0.5 degrees. To achieve this orbit, Ariane 5 was expected to use leftover performance for an inclination-reduction maneuver by the second stage while flying across the Atlantic. 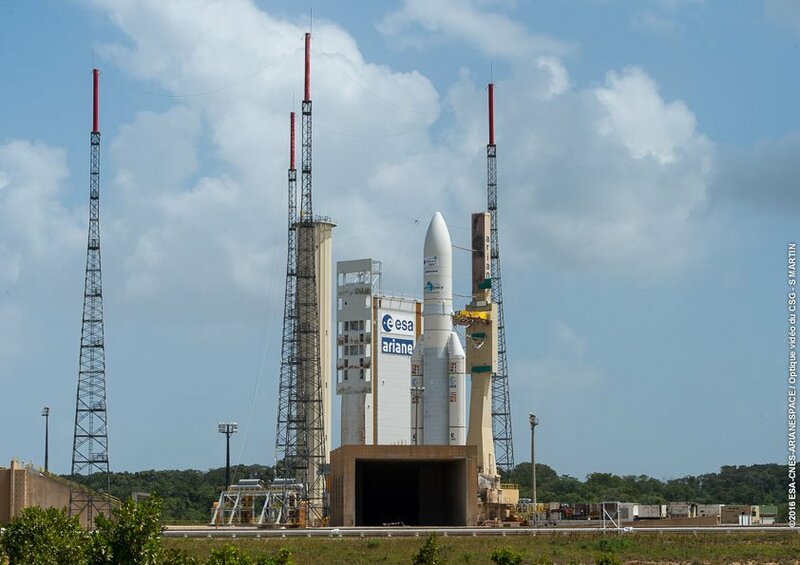 Ariane 5 headed into its long 11.5-hour countdown operation early on Wednesday, working towards an 80-minute launch window opening at 23:20 UTC. Once powered up, Ariane 5 began an extensive set of checkouts of its electrical, communication, computer, range safety and ground support systems. By six hours to T-0, teams finished closing out the Ariane 5 rocket and the setup for propellant loading, departing the ELA-3 launch complex for tanking and the pressurization of attitude control systems. Propellant loading procedures kicked off four hours ahead of launch with the setup of ground systems and the chilldown of transfer lines and tanks. 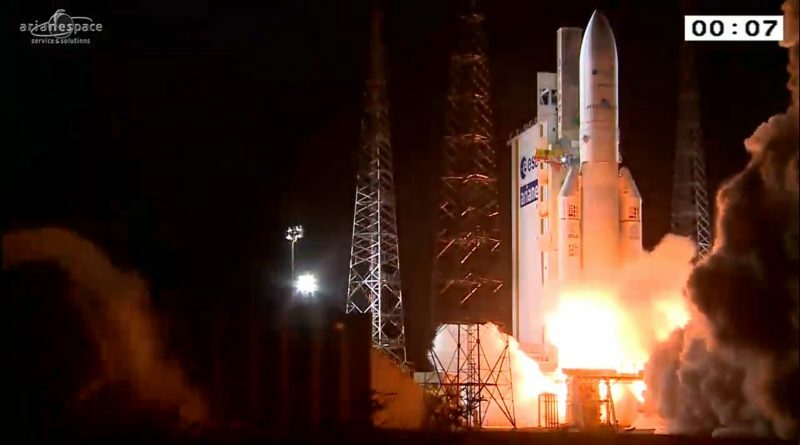 Over the course of a two-hour process, the first stage of the Ariane 5 received 133,000 Kilograms of -183°C of Liquid Oxygen and 26,000kg of -253°C Liquid Hydrogen while the second stage was loaded with 14,900kg of cryogenics. Measuring 30.5 meters in length and 5.4 meters in diameter, Ariane’s first stage hosts a Vulcain 2 main engine capable of delivering 1,340 Kilonewtons of thrust. Sitting on top of the core stage, the 4.7-meter long ESC second stage is powered by a 62.7kN HM-7B engine. Throughout the tanking sequence, Ariane 5 continued testing operations and the Vulcain engine entered its chilldown sequence around three hours ahead of launch. Heaters on the rocket were reconfigured and the launch team continued monitoring all systems parameters while calling up the downrange ground stations to report readiness to track the ascending rocket and also verifying weather conditions at the launch site. Final telemetry, tracking and command system checks were performed at T-70 minutes and inside one hour to launch, Ariane 5 received a final update to its flight software based on upper level wind measurements. Teams then completed the final preparatory steps for the Synchronized Sequence and Intelsat 29e transitioned to battery power to get ready for its trip into orbit. The highly choreographed Synchronized Sequence picked up seven minutes prior to liftoff as computers assumed control over the final crucial steps to transition Ariane 5 to its autonomous liftoff configuration. As part of the sequence, the 777-metric-ton Ariane 5 switched its two stages to internal power, armed its safety and pyrotechnic systems, and began pressurizing the propellant tanks after ground propellant and pressurant feeds were terminated. 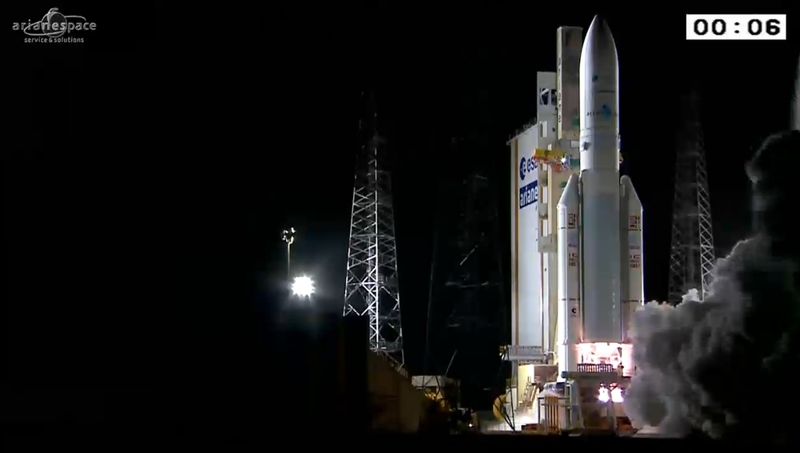 The engine was set up for ignition and Ariane 5 activated onboard recorders as all stations remained GREEN for liftoff. The ignition sequence kicked off at T-37 seconds as the attitude control system on the first stage was enabled and the POGO System that is used to prevent any engine related oscillations was pressurized for flight. Six seconds before ignition, the Cryogenic Umbilical Arms retracted, control was handed over to the launch vehicle’s computers and the Hydrogen Burn-Off System was activated. 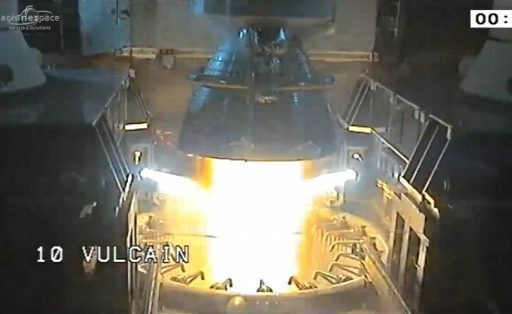 Having been handed full control of all vehicle functions, Ariane 5 commanded its Vulcain 2 engine to ignite when clocks hit zero at 23:20:00 UTC. Soaring up to a thrust of 98 metric-ton-force, the engine was carefully monitored by computers to ensure it reached operational conditions before the point of no turning back – the ignition of the boosters. With Vulcain 2 showing a clean ignition, the twin boosters were commanded to ignite at T+7.3 seconds to lift Ariane 5 off the ground with a total thrust of 1,420 metric-ton-force – equivalent to ten Airbus A380s at full throttle. After its thundering evening liftoff, Ariane 5 quickly gained altitude as it made a six-second vertical climb, lighting up the night skies over the Atlantic coast of French Guiana. The twin boosters delivered 92% of the vehicle’s total thrust as Ariane 5 initiated its pitch maneuver followed by the roll maneuver to get aligned with a due easterly ascent trajectory across the Atlantic Ocean, aiming for a low-inclination orbit. 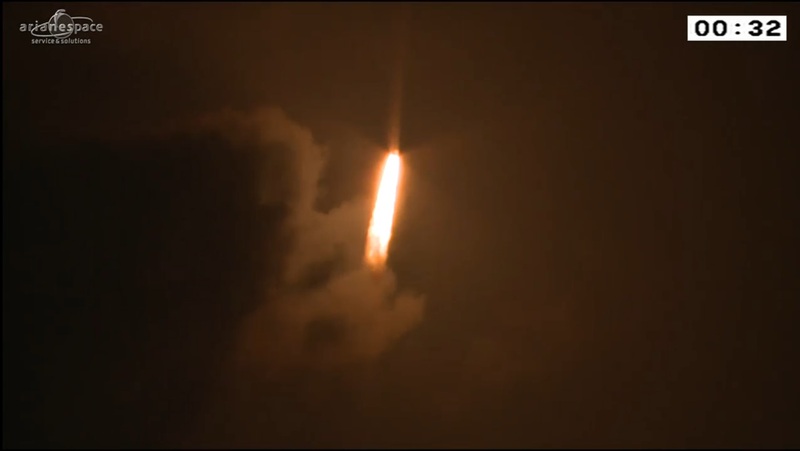 Pitch and roll ended by T+32 seconds and Ariane 5 reached the speed of sound just 48 seconds after liftoff. Burning through 3,600 Kilograms of propellants per second, Ariane 5 passed maximum dynamic pressure when reaching an altitude of 13 Kilometers. Throughout the initial flight phase, Ariane 5 headed down the expected flight trajectory and all systems showed a good performance. Helping accelerate the rocket to a speed of over two Kilometers per second, each of the twin boosters burned through 237,000 Kilograms of propellant. The EAP booster measures 31.6 meters in length and 3.05 meters in diameter, capable of delivering 6,470 Kilonewtons of thrust. Burnout of the boosters came two minutes and 24 seconds into the flight, sensed by the launch vehicle through the drop in chamber pressure on the solids. Upon burnout, the SRBs were jettisoned by pyrotechnic systems and retrorockets firing on each booster to push it outward and away from the vehicle that was 69 Kilometers in altitude at the time. After a clean separation of the twin boosters, Ariane 5 continued powered ascent under the power of its Vulcain 2 engine alone, burning 290 Kilograms of propellants per second to generate a thrust of 136,600 Kilogram-force when flying through the rarefied layers of the upper atmosphere. Three minutes and 38 seconds into the mission, when flying 123 Kilometers in altitude, Ariane 5 could separate its payload fairing to expose the single satellite payload as the delicate hardware could no longer be harmed by aerodynamic forces. Measuring 17 meters in length, the fairing of Ariane 5 was split open and rotated outward before separating cleanly, without contacting the payloads or second stage. Picking up the pace, Ariane 5 headed downrange from French Guiana, being passed from ground station to ground station to keep up a steady stream of telemetry from the rocket for analysis in real time and to be stored for in-depth reviews after the flight. The first downrange station was Natal that came into play eight minutes into the flight to cover staging since the Galliot station was expected to lose the signal from Ariane 5 right around the time of stage separation. Later in the flight, stations on Ascension Island and in Gabon & Kenya, Africa provided data relay from the rocket. The Vulcain 2 engine of the first stage was shut down eight minutes and 46 seconds into the flight when the stage had consumed its propellant supply – lofting the stack into a sub-orbital trajectory with a 230-Kilometer apogee. Separation of the stages came six seconds later as pyrotechnics fired and loaded springs pushed the spent core stage away to head for re-entry and splashdown. Right on time, at T+8 minutes and 56 seconds, the H-7B engine of the second stage soared up to its full thrust of 6,400 Kilogram-force for a burn of 15 minutes and 45 seconds. The second stage was tasked with raising the speed of the stack to an injection velocity of 9.43km/s and also reducing the inclination from 10.3 to 0.5 degrees to optimize the orbit of the satellite. This ascent trajectory was different from dual payload missions of Ariane 5 in which the first stage flies a slightly less-lofted trajectory, reaching an apogee around 160 Kilometers, but reducing the inclination to 7°. 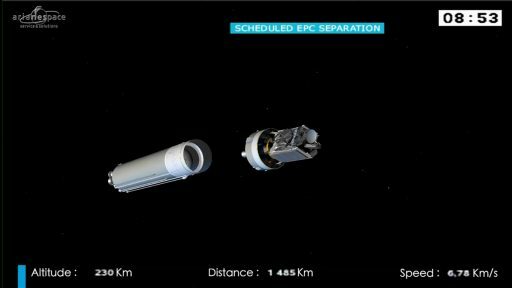 In Wednesday’s case, the second stage was tasked with a larger reduction in inclination by performing its burn slightly out of plane. 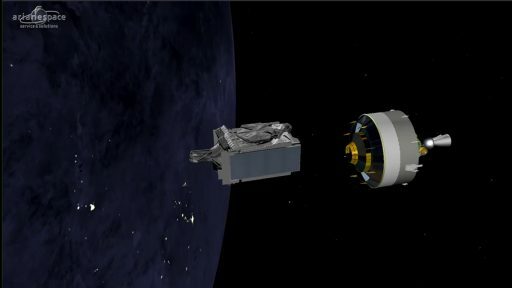 The VA228 mission targeted an orbit of 248.8 by 35,546 Kilometers at an inclination of 0.5 degrees offering a fuel-efficient route up into Geostationary Orbit to the satellite given the low-inclination of the initial orbit that will spare Intelsat 29e some fuel for inclination reduction. 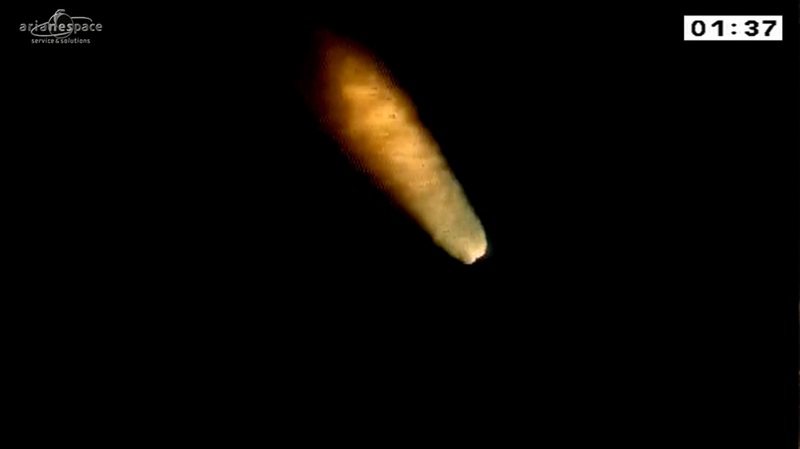 Throughout the burn of the second stage, the vehicle remained on a nominal trajectory, showing a good performance of its propulsion system and flight control systems. 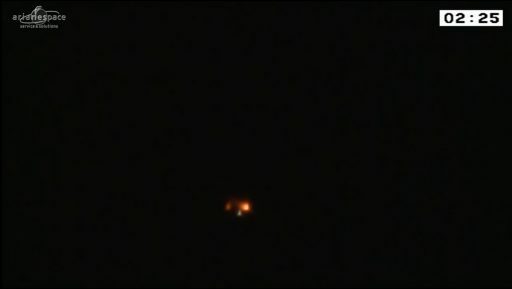 Second Stage Cutoff occurred just before hitting the 25-minute mark when the vehicle was passing an altitude of 557 Kilometers. At the conclusion of the second stage burn, Ariane 5 headed into its ballistics phase, starting with the re-orientation for satellite separation right at T+25 minutes. Next was a transverse spin-up for satellite separation beginning one minute prior to spacecraft deploy. 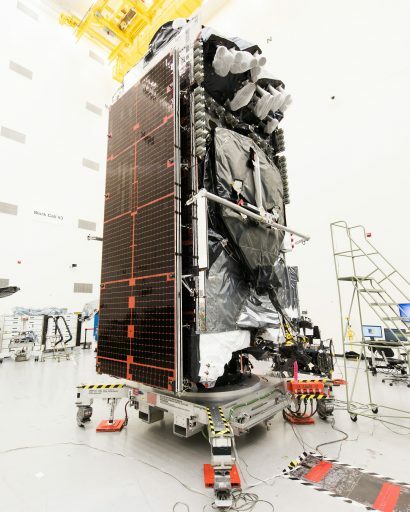 Intelsat 29e was send on its way just before hitting T+30 minutes, starting a mission of at least 15 years to deliver a variety of communications services to the Americas and the trans-Atlantic flight routes. The separation of the satellite marked the success of the VA228 mission, the 84th flight of Ariane 5 and its 70th consecutive success, though the second stage was still tasked with the usual collision avoidance and passivation maneuvers to achieve a safe state by T+43 minutes. 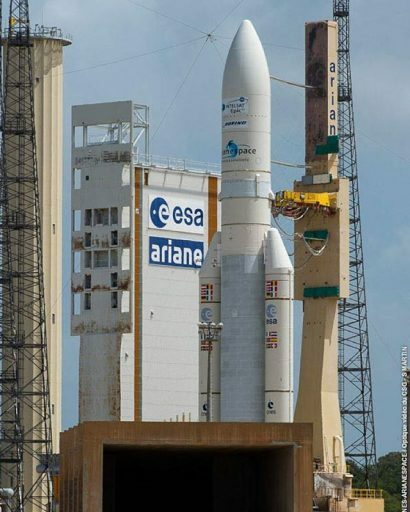 For Arianespace, the next mission on the books is another single-satellite launch on the Ariane 5 when the Eutelsat 65 West A spacecraft will make its way into orbit, currently expected on March 7. After that, Soyuz will make its first of two launches of the year in April when lofting the Sentinel-1B satellite. Vega, the smallest of the Arianespace trio, will conduct a launch in July carrying the PeruSat-1 spacecraft and four spacecraft for SkySat. The heavy-lift Ariane 5 will be in action for an expected eight missions in 2016.